An increasing amount of both hard and soft corals are spawning successfully in aquaria. Some species may not yet been scientifically documented. ZSL to date have developed a number of “Citizen Science” projects where communities may be leveraged upon to create trends for hypothesis and investigation. This project involves the creating and marketing of an internet based “Coral Spawning Journal” which will record user contributed images and video as well as environmental variables such as temperature, pH, alkalinity, salinity, date, nutritional input and lunar cycle variables where available. The project aims to identify catalysts and trends in spawning activities for further investigation as well as providing an educational resource for promoting husbandry techniques based on findings as well as a list of guidelines for participants to look for. 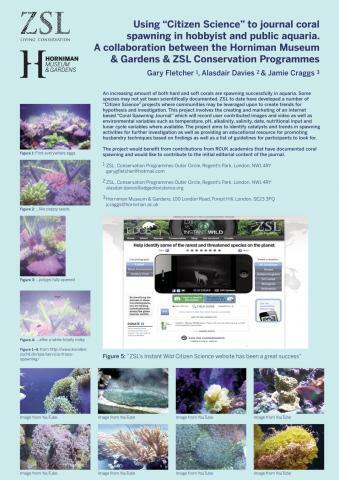 The project would benefit from contributions from RCUK academics that have documented coral spawning and would like to contribute to the initial editorial content of the journal.